Positron emission tomography (PET) imaging reporter genes (IRGs) and PET reporter probes (PRPs) are amongst the most valuable tools for gene and cell therapy. PET IRGs/PRPs can be used to non-invasively monitor all aspects of the kinetics of therapeutic transgenes and cells in all types of living mammals. This technology is generalizable and can allow long-term kinetics monitoring. In gene therapy, PET IRGs/PRPs can be used for whole-body imaging of therapeutic transgene expression, monitoring variations in the magnitude of transgene expression over time. In cell or cellular gene therapy, PET IRGs/PRPs can be used for whole-body monitoring of therapeutic cell locations, quantity at all locations, survival and proliferation over time and also possibly changes in characteristics or function over time. In this review, we have classified PET IRGs/PRPs into two groups based on the source from which they were derived: human or non-human. This classification addresses the important concern of potential immunogenicity in humans, which is important for expansion of PET IRG imaging in clinical trials. We have then discussed the application of this technology in gene/cell therapy and described its use in these fields, including a summary of using PET IRGs/PRPs in gene and cell therapy clinical trials. This review concludes with a discussion of the future direction of PET IRGs/PRPs and recommends cell and gene therapists collaborate with molecular imaging experts early in their investigations to choose a PET IRG/PRP system suitable for progression into clinical trials. The fields of gene and cellular gene therapy have seen considerable progress over the past two decades with both viral and non-viral transgene delivery techniques advancing into clinical trials.1-3 Yet, there is only one gene therapy drug, Gendicine (Shenzhen SiBiono Gene Technologies Co. (SiBiono) Ltd.) approved for commercialization in China. Concerns about safety (mutagenesis, immune reactions, etc…) and limited demonstrations of efficacy are slowing the advancement of gene therapeutics into approved drugs. Monitoring the kinetics of administered therapeutic transgenes, especially during clinical trials would help in the optimization of both gene therapeutic agents and their administration protocols. In gene therapy we monitor kinetics by determining the sites, magnitude and time variation of therapeutic transgene expression in vivo following administration. 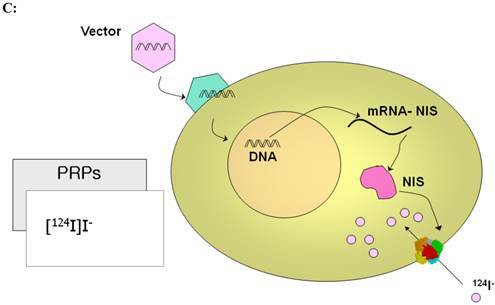 In cellular gene therapy kinetics are monitored by tracking the locations of genetically engineered therapeutic cells, measuring their quantity at each location and determining changes in their characteristics at various time points in vivo following their administration. These kinetic studies will also provide information about proliferation and persistence of genetically engineered therapeutic cells. Ideally, kinetic studies should be non-invasive, to avoid potential complications of surgical procedures or tissue sampling. In addition, whole-body kinetics monitoring would be ideal. 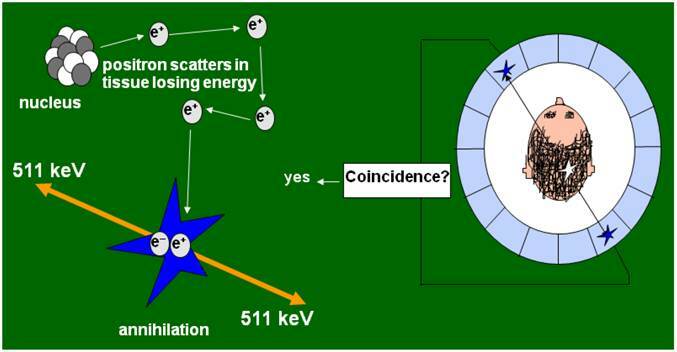 Positron emission tomography (PET) takes advantage of coincidence detection of two 511 KeV gamma rays, emitted at an angle of about 1800 when positrons collide with electrons (Figure 1). This annihilation event allows precise detection of the location of positron radiolabeled molecules and uniquely permits the quantification of molecular events in vivo. 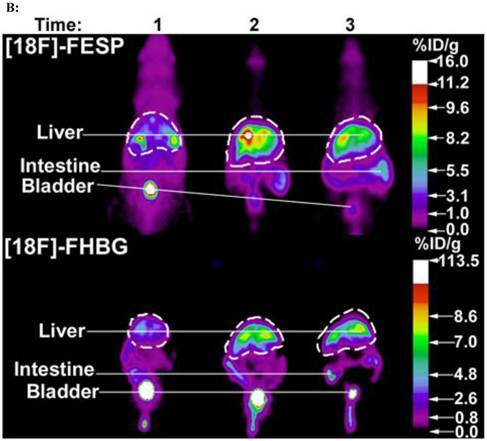 Furthermore, the short half-life of fluorine-18, the radioisotope that is commonly used for labeling PET tracers allows for repetitive imaging, which in turn permits studying kinetics in vivo. 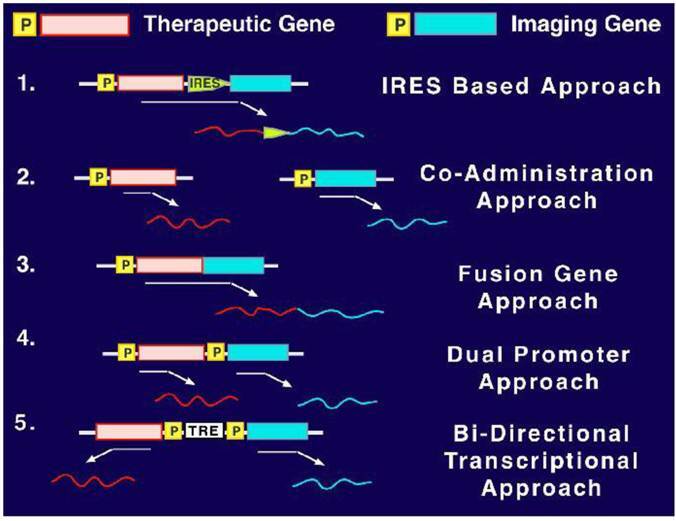 In this review, we will focus on PET IRGs and their applications in gene and cellular gene therapies. PET imaging probes reveal the presence of their target by accumulating on the surface or inside the cells containing the target while clearing from other cells. PET reporter probes (PRPs) image the expression of their PET IRGs in the same manner, by accumulating on the surface or inside the cells expressing the PET IRGs. Therefore, traditionally, PET IRG/PRP systems have been classified into three groups based on the way the protein product of the PET IRG interacts with its PRP to cause its accumulation: (i) PET IRGs encoding enzymes that phosphorylate specific PRPs which causes their intracellular entrapment (Figure 2A); (ii) PET IRGs encoding protein receptors that can be bound by specific PRPs (Figure 2B); (iii) PET IRGs encoding cell membrane transporters that facilitate the flow and accumulation of specific PRPs into cells (Figure 2C). Mechanism of positron emission tomography (PET) imaging. 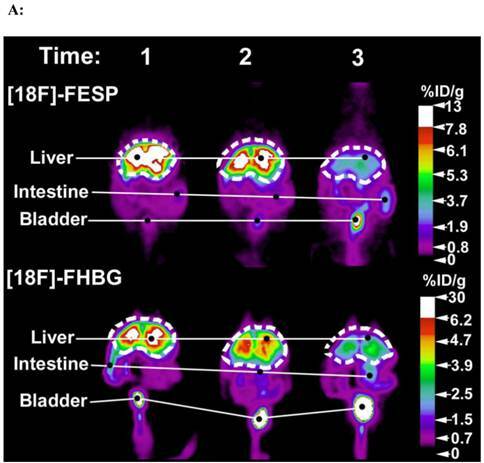 PET is a molecular imaging modality useful for pre-clinical and clinical imaging of molecular events in living subjects. 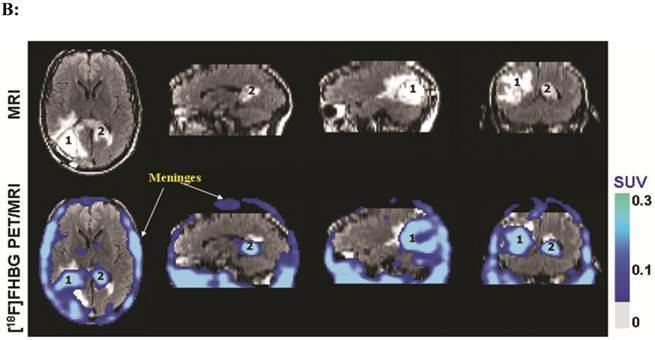 PET imaging involves a positron emitting radioisotope labeled imaging probe and instrumentation that can detect in a coincidence manner the radiation emitted when positrons from the imaging probe collide with nearby electrons. In this manner, PET cameras acquire data about the precise location of imaging probes inside the body of a living subject and the amount of imaging probe accumulated at every site at any given time. PET imaging probes usually accumulate at a site through binding to receptor molecules, interaction with an enzyme, or a cellular transport mechanism. An unresolved issue of using IRGs to monitor therapeutic transgene or cell kinetics is immunogenicity of IRGs. As illustrated in figure 3, immunogenicity of a PET IRG can be detrimental to adoptively transferred therapeutic cells expressing it. Therefore, most recently, efforts towards developing human derived PET IRGs are being intensified. Current PET IRG and PRP systems can be grouped into a) those derived from viruses and other non-human sources that are likely to be rejected by the human immune system, and b) human gene-based PET IRGs that are less likely to be rejected by the human immune system. Table 1 suggests characteristics of a PET reporter gene/probe system that would be best suited for clinical gene and cell therapy applications. Table 2 lists the PET IRG/PRP systems that have thus far been studied. The mechanism and consequences of PRG immunogenicity. The PRG is transcribed and translated in genetically engineered therapeutic cells; peptides derived from the PRG are displayed on the cell surface in the context of MHC class I molecules. If these peptides have never been encountered by the host immune system (i.e., they are 'foreign'), they are detected by CD8+ T cells, which then kill the therapeutic cells, leading to treatment failure. In contrast, if the PRG is sufficiently similar or identical to a gene normally expressed by the host ('self' rather than 'foreign') it is less likely that the therapeutic cells will be detected as 'foreign' and eliminated. 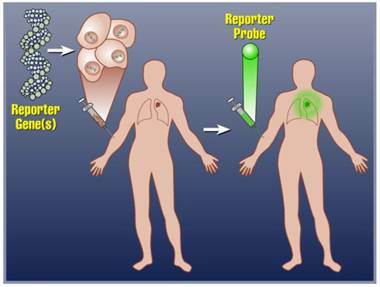 Characteristics of an ideal PET reporter gene (PRG)/probe (PRP) system for clinical gene and cell therapy imaging applications. 1. The protein encoded by the PRG does not cause an immune reaction. Ideally the PRG is a human-derived gene that is not expressed. 2. The protein encoded by the PRG is inert. It does not cause cytotoxicity by itself and after interaction with the trace amounts of the PRP. It also does not alter the normal or intended functions of the cells, having no effect on the cells' characteristics. 3. Image signal correlates well with the levels of PRG mRNA and protein in tissues of the living subject. 4. For transgene delivery applications, the size of the PRG is small enough to fit into the appropriate transgene delivery vehicle. 5. For cell therapy applications, the PRG can also serve as a safety gene, enabling suicide elimination of therapeutic cells if they are causing severe adverse effects. 6. PRP can be synthesized rapidly enough before significant decay has occurred and with high specific activity. 7. The PRP is accumulated only by the cells expressing the PRG. The PRP is cleared rapidly from organs or tissues that do not contain the cells expressing the PRG. The PRP does not attach to and rapidly effluxes from cells not expressing the PRG. 8. The PRP is stable and the signal emitting moiety of the PRP is not cleaved before reaching target cells and while accumulated by the PRG expressing cells. Excess PRP is cleared or metabolized and cleared rapidly to reduce background. 9. PRP or its metabolites are not toxic at 100X the required administered doses. This is unlikely to be an issue for PET tracers. 10. The PRP has ideal dosimetry in humans, allowing injection of sufficient doses, multiple times within a year without exceeding 5 REM to any organ or 3 REM to sensitive organs, such as bone marrow, lens of the eyes, testicles and ovaries. 11. PRP can cross physiological barriers to reach the target PRG expressing cells. For example, an ideal PRP would cross the blood brain barrier. 2. PEG is non-toxic and FDA approved 1. Long half-life of iodine does not allow dynamic imaging of molecular events. Herpes simplex virus 1 thymidine kinase (HSV1-tk) and its mutant derivatives have thus far been the most extensively studied and applied PET IRGs. These PET IRGs encode enzymes that catalyze phosphorylation reactions causing entrapment of their probes inside cells expressing them (Figure 2A). The specific PRPs for these PET IRGs are poor substrates for mammalian thymidine kinase 1; hence they will not be trapped within cells that don't express HSV1-tk or its mutants. Enzyme based PET IRGs have high sensitivity because each enzyme can catalyze many phosphorylation reactions causing signal amplification. However, in PET, target to background activity ratios determine the true sensitivity of the imaging assay. Over the last 15 years, mutants of HSV1-tk have been created to increase sensitivity, reduce affinity for thymidine, increase affinity for some PRPs while eliminating affinity for other PRPs, and shorten the half-life of the PET IRGs.18-25 New PRPs have been synthesized and evaluated to increase affinity for either HSV1-tk or its mutants and reduce background activity in some organs such as liver or gut.26-33 Most of these PRPs (such as for instance, [18F]FHBG and [18F]FEAU) were labeled with fluorine-18, while some others (for instance [124I]FIAU) were labeled with Iodine-124). Fluorine-18 has a short half-life of ~ 110 minutes; whereas Iodine-124 has a long half-life of 4.18 days. As an advantage, fluorine-18 labeled PRPs permit imaging on two consecutive days and are more suitable for monitoring time variation of therapeutic transgene expression or therapeutic cell biodistribution than iodine-124 labeled probes. HSV1-tk and its mutants have several advantages for gene and cellular gene therapy applications. Many PET and single photon emission computerized tomography (SPECT) reporter probes are available with suitable pharmacokinetics in rodents, pigs and humans. Several of the available PRPs exhibit relatively low background activity in mammalian cells and tissues (because they are poor substrates for mammalian TK1). They have multiple utilities as PET IRGs, suicide genes (i.e. genes that can activate pro-drugs and make them toxic to for instance cancer cells) and safety genes (can be used through their suicide mechanism to eradicate therapeutic cells, if they cause an adverse effect).36 In addition, these enzyme/radionuclide based PET IRG/PRP systems have been validated for imaging of a variety of molecular events, non-invasively, in living mammals, including humans. Nevertheless, HSV1-tk and its mutants have shortcomings that limit their utility. One limitation is the potential immunogenicity of HSV1-tk and its mutants that limits their application in immuno-competent hosts. For example, an immune reaction to the protein products of these PET IRGs may cause pre-mature elimination of the therapeutic cells that are expressing them.37,38 Therefore, as discussed later in this review, human derived PET IRGs have been and are being developed to address these limitations. Another limitation is that the PRPs do not cross the blood brain barrier (BBB); hence they may not be useful in cases where therapeutic transgenes or cells are targeted to sites within the central nervous system. For example, they may not be useful for monitoring the kinetics of therapeutic stem cells administered for the treatment of some neurodegenerative disorders. Finally, improvements in imaging sensitivity of HSV1-tk, its mutants and other PET IRGs, would increase their utility in monitoring therapeutic transgene or cell kinetics. Two other PET IRGs of non-human origin, the Varicella-Zoster virus thymidine kinase (VZV-tk) and LacZ will likely encounter immunogenicity issues.39,40 The VZV-tk PET IRG was developed with the hope that its PRPs bicyclic nucleoside analogues (BCNA) could cross the BBB. However, this approach failed. The LacZ gene encodes the bacterial β-Galactosidase (β-Gal) enzyme, used as a reporter gene (RG) for in vitro studies with chromogenic and fluorogenic reporter probes and can also serve as a MRI reporter gene.41-43 However, thus far all PRPs designed for β-Gal either do not cross cell membranes or are not specific.40 Therefore, amongst PET IRGs that do not have a human gene counterpart, HSV1-tk and its optimized mutants and PRPs still represent the most useful PET IRG systems and they should serve as essential tools for non-invasive pharmacokinetics monitoring in both cell and gene therapy investigations. Immunogenicity toward proteins encoded by reporter genes can cause major problems in therapeutic transgene or cell kinetics monitoring studies. In gene therapy, it may shorten the duration of PET IRG expression. In cell or cellular gene therapy, it may cause pre-mature eradication of the therapeutic cells expressing the PET IRG. Several genes encoding protein receptors, transporters and kinases have been investigated that might serve as non-immunogenic PET IRGs in humans. Alternatively, they might have mammalian species specific counterparts that can be used without rejection in immunocompetent animal research models.44 These include dopamine type 2 receptor (D2R)45-48, human estrogen receptor α ligand binding domain (hERL)49,50, human type 2 somatostatin receptor (hSSTr2)51-54, recombinant carcinoembryonic antigen (CEA)55, engineered antibody fragments56, sodium iodide symporter (NIS)57-61, human norepinephrine transporter (hNET)62, human mitochondrial thymidine kinase type 2 (hmtk2)63,64, mutant deoxycytidine kinases65, and anti-polyethylene glycol (anti-PEG)66. Therapeutic transgenes (TGs) are delivered into living organisms either directly or by using cells as vectors, which are then delivered into the mammal. There are two approaches to image the expression of TGs with PET: 1) If a specific PET probe is available, the mRNA or protein encoded by the TG can be detected directly (Figure 4).36,67 2) If a specific PET probe is not available, the TG can be imaged indirectly by linking its expression to the expression of a PET IRG. The direct approach can be used to monitor expression of HSV1-tk or its mutant HSV1-sr39tk during suicide gene therapy of cancer (Figure 5), since several specific PET probes are available for detecting the enzymes encoded by these TGs/PET IRGs.13,14,25,36,68-71 However, specific PET probes are not available for most TGs and the costs of developing new specific PET probes for each TG are high; hence the second approach of indirect imaging with PET IRGs may be more practical. Direct imaging of a therapeutic transgene's products with PET. 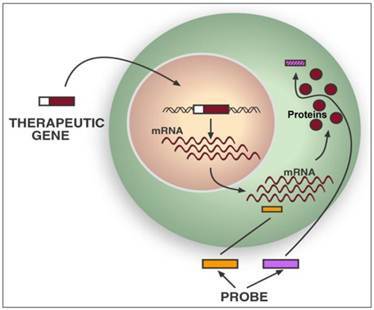 Specific PET probes may be designed and developed to directly image the messenger ribonucleic acids (mRNA) transcribed from a therapeutic transgene (TG) or the protein translated from its mRNA. 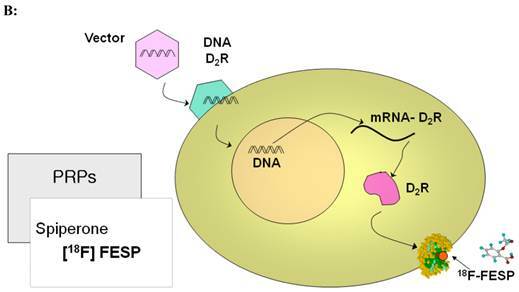 Examples of potential mRNA PET imaging probes are radiolabeled antisense oligo-nucleotides (RASONs) or modifications of RASONs that are complementary to a specific region of an mRNA. There are also PET imaging probes that specifically detect a certain protein by binding to it or even detect the protein's function. Examples are specific detection of D2R with [18F]FESP and specific detection of HSV1-sr39TK enzyme activity with [18F]FHBG. However, developing a new specific PET probe to image the expression of any TG requires significant expenditure of resources and may not be practical. Five techniques are available for linking the expression of a transgene with a PET IRG for indirect imaging (Figure 6).46,72-80 The first, internal ribosomal entry site (IRES) based approach, involves the use of a single gene expression regulatory element to derive the mRNA expression of both the TG and the PET IRG, while the IRES enables the translation of two separate proteins encoded by these transgenes. This approach has been validated and shown to yield correlated detection of the two proteins encoded by two IRGs that were linked in this manner.46,75,78,79,81 Usually, the TG is inserted upstream of the IRES and the PET IRG would be inserted downstream of the IRES to avoid attenuation of TG expression that may occur when a transgene is downstream the IRES. The disadvantage is that attenuated expression of the PET IRG would reduce detection sensitivity. This approach is mostly suitable when one wants every single cell that has the TG to also have the PET IRG, but wants to avoid any interference with the protein encoded by the TG. The second co-administration approach employs two identical transgene delivery vectors containing identical gene expression regulatory elements, one carrying the PET IRG and the other carrying the TG. This simple approach works because PET can only image a population of cells that would have equal access to and the ability to take up both transgene delivery vectors.73,76 In fact, Yaghoubi et al. 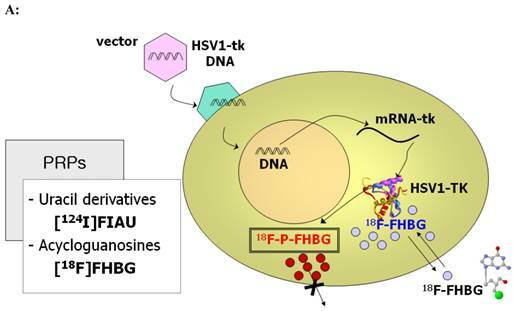 initially demonstrated that when various equivalent titers of two identical adenoviruses, one carrying HSV1-sr39tk and the other carrying D2R, are co-delivered by intravenous injections into lateral tail veins of mice, a good correlation is observed between activities of [18F]FHBG or [18F]FESP in the livers of these mice (Figures 7A&B).73 This approach may be ideal when the vector containing the TG has already been validated and one does not want to alter the vector to also include a PET IRG; hence one would produce an identical vector containing the PET IRG to co-administer with the vector carrying the TG, thereby tracking the kinetics of TG expression indirectly. The third, a fusion gene approach involves inserting the TG and IRG next to each other, regulated by a single promoter, such that a single encoded mRNA and fusion protein contains the product of both transgenes. Interestingly, this technique has not yet been evaluated for imaging a TG, using PET IRGs, but lead to the development of multimodality IRG constructs.82-88 The main problem with this approach is that the quaternary structure of the fusion protein may significantly alter the function of the protein encoded by the TG and significantly reduce detection sensitivity of the protein encoded by the PET-IRG. Therefore, this approach may be ideal if lack of protein function alteration can be confirmed, because it may yield the best correlation between the expression of TG and PET IRG. The forth, dual promoter, approach involves inserting both the TG and the PET IRG on the same construct each having its own separate but identical promoter.89 This approach also ensures single cell co-delivery and translation of separate proteins from the mRNAs encoded by the PET IRG and the TG. Adoptive cellular gene therapy is a promising approach for treating a variety of diseases, including neurodegenerative, cardiovascular and autoimmune disorders as well as cancer.90-93 Targeted therapeutic cells (TCs) are injected into patients to restore normal organ function in degenerative diseases, eliminate cancer cells, or correct a system malfunction in other diseases. Selection of appropriate cells, optimization of the cells to perform a specific therapeutic function and determination of an appropriate administration route and cell dose are necessary to achieve the desired therapeutic effect. Currently, only PET or SPECT IRGs are generalizable tools for non-invasive imaging of all aspects of TC kinetics in mammals larger than rats.4,5,8,101 To use PET IRG imaging for monitoring the biodistribution, survival, proliferation and estimate quantities of TCs, these cells are first genetically engineered ex vivo to stably express a PET IRG under the control of a strong constitutive promoter. Then, at desired time points, following adoptive transfer of the genetically modified TCs, the PET reporter probe is injected and the recipient of the TCs is scanned with PET (Figure 8). 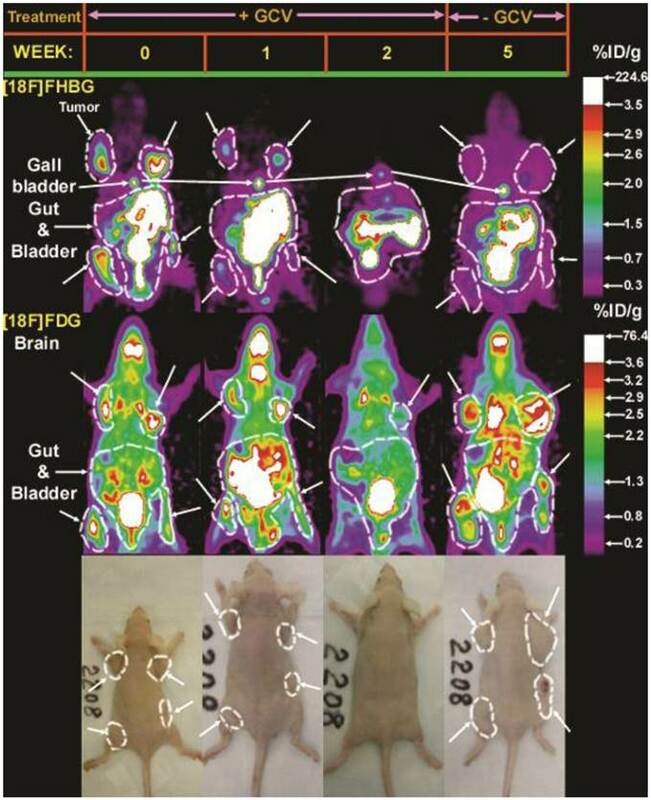 PET IRGs have been used to monitor the kinetics of various potential TCs, including immune cells, stem cells and pancreatic islets, in pre-clinical living animal models.102-123 Therefore, PET IRGs are valuable tools, one should use during development of cellular gene therapy techniques for treatment of cancer and autoimmune, cardiovascular and neurological disorders. PET IRG based imaging of the kinetics of a TC population. TCs are genetically engineered to stably express the PET IRG ex vivo. 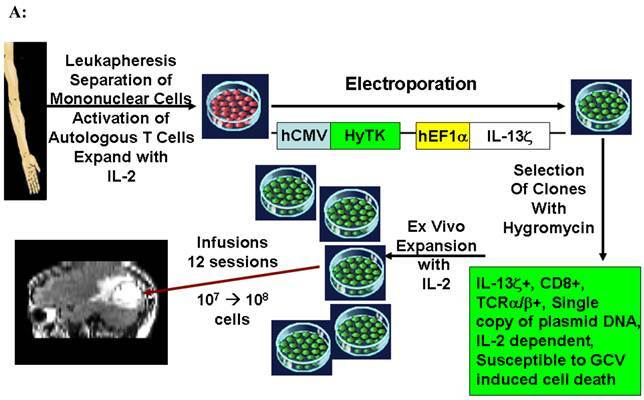 Following confirmation of PET IRG expression TCs are injected into the living subject. At any desired time point after TC administration the specific PRP is injected into the living subject and the subject is scanned for the biodistribution of the PRP. Quantitative PRP biodistribution analysis then allows studying the kinetics of the TCs in the subject. The sensitivity of PET IRGs is higher than that of optical IRGs in animals larger than mice, because gamma rays readily penetrate tissues. Furthermore, their sensitivity is higher than that of MRI IRGs in all mammals. Therefore, they can be used for gene and cell therapy clinical applications. In fact, radionuclide based IRGs, have thus far been the only IRGs able to provide whole-body images of transgene expression in humans. A major goal for PET IRGs and their probes is their wide-spread adoption by academic and industry developers of various cell and gene therapy approaches. We believe, this requires close and early collaborations between molecular imagers and cell/gene therapists. This would afford a parallel approach starting with pre-clinical studies so that PET reporter gene imaging can be incorporated into the cell or gene therapy investigational new drug protocol. Early collaboration is also needed for optimizing the delivery of the PET IRG for the specific cell or gene therapy approach. Safe and stable PET reporter transgene delivery for clinical applications is a major hindrance to adoption and will be better addressed when molecular imagers and gene therapists collaborate early. Early collaboration may also help resolve another hindrance to clinical translation, which is efficient delivery of PET IRGs into primary cells that cannot be cultured ex vivo for long periods of expansions. The hope for not too distant future of this invaluable technology is exponential growth in its use in cell and gene therapy clinical trials. This is likely to happen soon as additional non-immunogenic PET IRGs with high sensitivity probes become available. Improvements to the currently existing PET IRGs would also help broaden their use in cell and gene therapy trials. PRPs with better pharmacokinetics, with reduced backgrounds and increased bioavailability would also enhance the application of PET IRG based cell and transgene imaging. However, again working early with IRG experts, gene and cell therapists will be able to choose the most suitable currently available PET IRG/PRP system that would allow progression into clinical trials. A new molecular-genetic imaging industry is emerging with the aim of educating therapeutics firms and regulatory agencies about the applications of imaging reporter genes and expanding their use in clinical trials. For example, CellSight Technologies located in California, USA was founded for this mission. A world-wide effort is underway, in North America, Europe, Southeast Asia and Australia to improve PET IRG technologies and satisfy requirements for getting them into clinical trials. Many of the gene and cellular gene therapy treatments currently listed on clinical trials.gov would benefit from PET IRG based transgene or cell kinetics monitoring. Of course, pre-clinical imaging studies would be required before incorporation of the imaging studies in the clinical trials. Table 3 lists some of the treatments that are currently recruiting for clinical trials that would benefit from PET IRG based imaging. In these studies PET-IRG based imaging would reveal the locations of genetically engineered cells administered for treatment and would inform early on whether appropriate targeting has occurred; hence enabling prediction of potential efficacy or adverse effects. As described in this review, PET IRG expression can also be linked to the expression of the therapeutic transgenes, which would enable monitoring the locations, magnitude and duration of expression of the therapeutic transgenes. Indeed in some cases linking is not even necessary. For example, some of the trials listed involve suicide gene therapy with HSV1-tk or radiation therapy following sodium iodide symporter gene therapy. Both of these therapeutic transgenes already have PRPs that can be used to image them during clinical trials. As the value of PET IRG based imaging is recognized in the future, we expect utilization of these tools in many gene and cell therapy trials. Currently recruiting gene/cellular gene therapy clinical trials that would benefit from PET IRG based kinetics monitoring in treatment development. Corresponding author: Shahriar S. Yaghoubi, E-mails: syaghoubiucla.edu; syaghoubicom.